As the United Nations issues a dire warning against global warming, every citizen and business needs to start taking more serious action – including the hospitality industry. 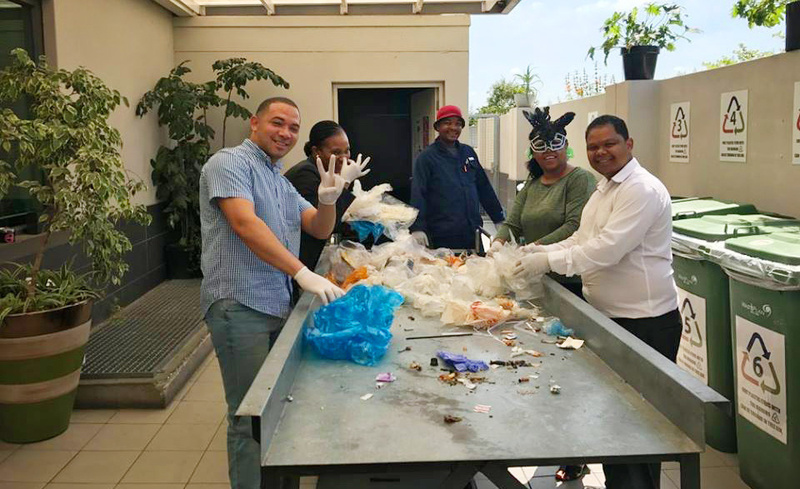 Sustainable waste management programmes should become a new focus for hotels so that they can continue to contribute positively to the economy while protecting the planet at the same time. Among these strategies, waste minimisation should be regarded as one of the most effective means of preventing pollution. The hospitality industry can also take steps to ensure that their waste is sorted and recycled appropriately so that only the bare minimum ends up in a landfill. One of South Africa’s leading ‘green hotels’, Hotel Verde in Cape Town, is paving the way for a new breed of environmentally-conscious hospitality developments. The hotel offers a self-proclaimed “carbon-neutral stay” for visitors, with a recycled greywater system, solar panel power, rainwater catchment tanks and a naturally-filtered swimming pool. Hotel Verde is also proud of their waste management programme. “We aim for zero waste to landfill! All waste is sorted on-site and where possible, recycled. With our suppliers, we have developed special reusable containers to avoid packaging. Food waste is composted or fed to our worm farm and goes back into the eco-system,” their website reads. “Our primary objective is to ensure that the properties we develop and operate have systems in place to minimise the consumption of natural resources, avoid and lower the generation of waste, reduce, reuse, recycle and recover waste where possible, and, as a last resort, treat and safely dispose of waste,” says group systems and sustainability manager at Hotel Verde, Dawie Meiring. Hotel Verde currently sends only three percent of their waste to landfill – the remaining 97% is either recycled, upcycled or composted. “Of the 2.2 kg of waste generated per guest per stay, only 64 grams [cannot] be diverted from landfill,” he explains. Besides implementing new and more efficient waste management strategies, hotels can also inform and educate their guests about the importance of minimising waste. Support for environmental practices requires the input of all guests, hotel staff and the surrounding community. Guests can play a role by minimising their waste while staying at the hotel. The staff can offer guidance and advice where needed, so their training is also important. “All our staff undergo sustainability training with the hotel’s eco team, the Green Guardians, so they are up to speed on all things sustainable,” says Hotel Verde general manager Lindy Meiring. “We have also installed split bins in all 145 rooms and at strategic points throughout the hotel along with educational signage and green tips – our guests are rewarded with a unique in-house currency called ‘Verdinos’ when they participate in correctly using the bins or any of the hotel’s other green initiatives,” she explains. Sustainable waste management practices begin with the guests and hotel staff and end with using the right waste management provider. All the efforts of the hotel in collecting and sorting waste will be pointless if a non-compliant service provider handles the waste off-site. Waste management should form a major part of all hotels’ sustainability strategies. Not only does it protect the environment and animals, but it preserves the planet for future generations.